Once you have recovered you pool table in Simonis pool cloth you will more than likely want to mark the cloth out with a break line and black ball spot. You may also wish to play snooker on your pool table and would like to mark the cloth out for a game of snooker as well. But where do you place the measurements? 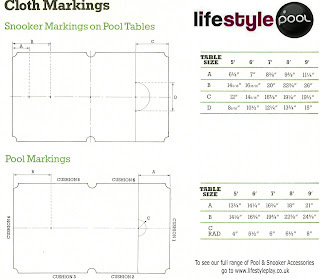 Below is a guide sheet that will allow you to place the correct marking onto you pool table. If you require a larger version please just drop us an email at info@simoniscloth.co.uk and we will be happy to provide one.